Cast: Will Smith, Jaden Smith, Thandie Newton, Brian Howe, Dan Castellaneta. Story: A single father struggles to support his son. 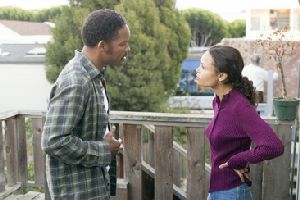 The Pursuit of Happyness is a modern day tale of perserverance with more than a passing resemblance to It's A Wonderful Life - and it may well be Will Smith's finest hour. Like Jimmy Stewart's Christmas classic, poor old Will Smith endures seemingly endless misfortune in his noble quest to single-handedly raise his son and provide a future for him at the same time. Somehow though, you know everything's going to be alright, so it's not too harrowing to watch. Unlike, say, Apocalypto, Smith's hardship is treated with sensitivity, so we're never less than 100% behind him. Smith himself, with an unflattering brillo-pad hairdo, is the heart and soul of the movie and gives a subtle yet powerful performance. He bravely resists the temptation to imbue his character with the Will Smith charm, instead playing him as a self-effacing and Will-ful underdog. It's a performance that marks a peak in his career so far and will probably net him an Oscar nomination to boot. 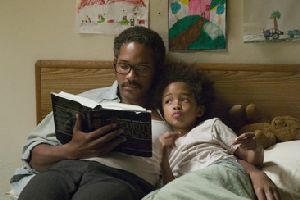 Smith's kid in the movie is his real-life sproglet Jaden, which gives their screen relationship enormous effortless chemistry. The kid's a natural and no doubt has a promising future ahead of him. There are a few oddities. Even when Will is down to his last 21 dollars, he can still afford to take his son to the diner etc. - the money never seems to actually run out - and there's a rather unpleasant undertone - the idea that money solves everything. Sure, when you're about to be evicted for non-payment of rent, a few hundred bucks is a life-changing thing, but I can't help thinking that our hero would've been much better off getting a paid job to support his kid, rather than aiming for the skies and risking everything on a roll of the dice. After all, for every person that succeeds, there's another hundred who fall on their faces into the gutter, but we don't want to see those stories on the big screen, do we? And stockbroking? Really? That's the American Dream? Are you sure? For a story based on emotional human drama, it's distastefully materialistic - as if "happyness" is all about dosh. Great message guys. Despite my reservations on the plot side, The Pursuit of Happyness is a top drawer movie. The performances of Will Smith and son are alone worth the price of a ticket and the story is both moving and compelling. There's no action to speak of, so Bubba won't be pleased, but as people movies go, there are few better. To enjoy this film you should be: into human stories. The Pursuit of Happyness was released in the UK on 12th January.